Dorsal longitudinal incision just ulnar to Lister's Tubercle. Step-cut insicion in the extenosr retinacular over the 4th dorsal compartment. Consider posterior interosseous nerve neurectomy. Transverse incision in capsule just proximal to the dorsal intercarpal ligament. Extend the incision proximally and radially along the radial aspect of the radiocarpal ligament as needed. Indentify the scapholunate interosseous ligament. It is typically avulsed from its scaphoid insertion. 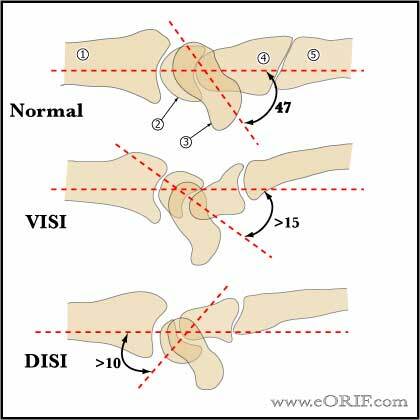 Evaluate the dorsal intercarpal ligament for injury to its lunate of scaphoid insertions. Evaluate for any chondral injury. Reduce scapholunate joint anatomically. 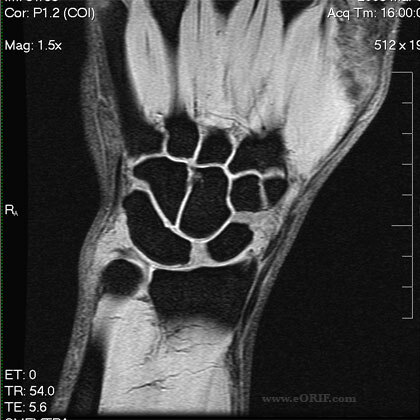 The scaphoid is typically flexed and the lunate is typically extended. K-wires may be needed to aid in the reduction. Place 1or 2 0.045 k-wires from radial to ulnar across the scapholunate joint and 1 -.045 K-wires from ulnar to radial across the triquetrolunate joint to maintain the reduction. Place mini-suture anchors (2.0-3.0mm) to anatomically restore the scapholunate interosseous ligament and dorsal intercarpal ligament. At 6 week follow-up change to short-arm splint. K-wires are removed at 10-12weeks. Consider occupational therapy if stiffness continues one month after pin removal.